Most of my swap quilts have travelled long distances to locations in Australia, Europe or at least the Northeast US. But this one had to journey only 200 miles and never even left the state. The Post Office says that it has arrived at its destination so now I can show it. This quilt was slow getting started because I couldn’t settle on a design. After staring at these lovely batiks for a while, I decided on a disappearing nine-patch, using both prints and a solid in each square. 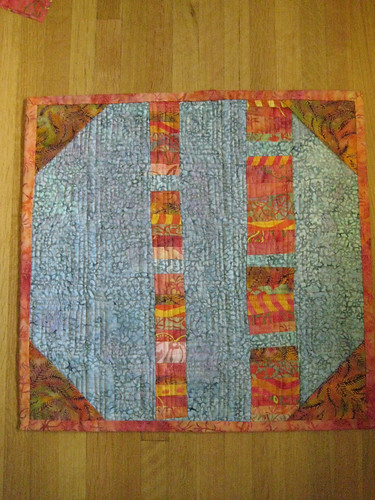 On the first attempt I cut 3.5″ squares which turned out too large for a small quilt. Next I tried it with 2.5″ squares. The size was more appropriate but the solid looked too boring with the batiks. And I wasn’t too jazzed about the disappearing nine patch after all. What to do, what to do? To complicate matters, my fabrics were all in the same value range. After much hemming and hawing I remembered a technique used by Malka Dubrawsky of A Stitch in Dye. She buys commercial fabrics, then overdyes or discharges them to vary the colors. Following her lead, I took the lightest print and faded it a little with diluted bleach. The result was just what my quilt needed- a lighter shade that would set off the other prints without looking too plain. But we were back to square one (pun intended!) on choosing a design. 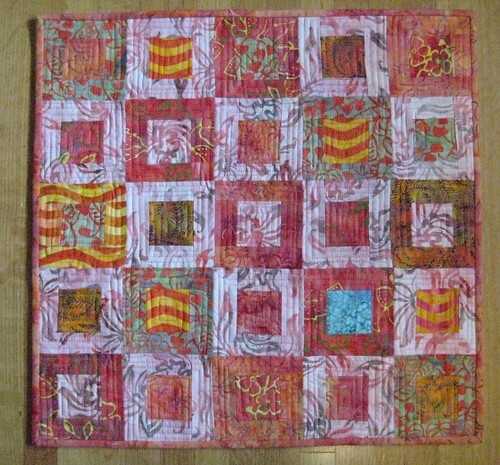 I started pairing the large and small squares to see which fabrics looked best together and liked what I saw. It was just a simple square-in-square but wow! When you have good fabric the design doesn’t have to be complicated. I threw in one turquoise square for contrast and started piecing. Once again, I took some good advice from Gwensdad and left that turquoise square unquilted. 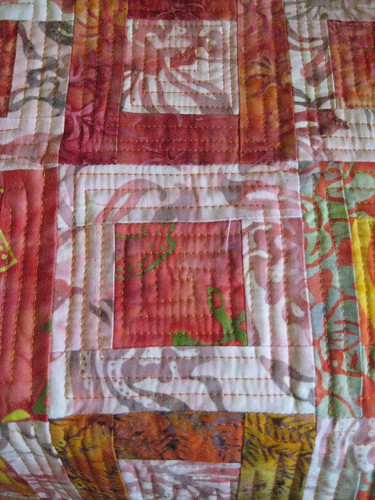 When the top was finished it read too pink, so I added some tangerine touches by quilting heavily with tangerine thread and using one of the more orangey batiks for the binding. There were a lot of scraps lying around at this point so I sewed some of them together freestyle and used them in the back of the quilt. I’m really not sure which side is my favorite! 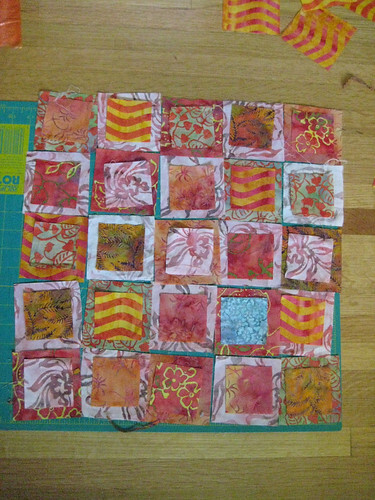 If my LQS has more of the blue batik I might just make myself a mini quilt with the rest of my tangerine scraps. This entry was posted on May 9, 2009 at 9:34 pm and is filed under Uncategorized. You can follow any responses to this entry through the RSS 2.0 feed. You can leave a response, or trackback from your own site. Really, really nice work! I absolutely love it – I’m sure your partner will as well! I am envious of your quilting skills. You did an excellent job! This has to be one of my favorite dqs quilts that I’ve seen! love the doll quilt. the addition of the turquoise block is perfect! love it! have no clue how you manage this. i can’t even keep a house clean! You are a goddess…the recipients of your quilts are very VERY fortunate women! My house isn’t clean either. this is fabulous! i love everything about it, front to back. i’m going to remember that bleaching techinque too. also, you’ve inspired me with all of your re-purposing. thanks! This is just gorgeous. I found you through flickr, I participated in DQS6 as well. It was my first swap and I loved it. How frustrating that you haven’t heard from the recipient. Just know there are loads of us who would be singing your praises had we received it!